SIMPSON BAY, St. Maarten (March 17, 2014) - Although it has over 200 stores around the world, most of them in Europe, Blanc du Nil, which opened its first airport store at SXM in 2012, moved into a bigger unit at the Princess Juliana International Airport (SXM) on Monday, March 17, 2014. The company had participated in the new commercial strategy of the airport and the unit it open on Monday is a result of its winning the bid for that landside location. “We’re happy to launch our new store at the airport. It is the first store we have at an airport, so it’s a new challenge,” said managing director Gilles de Sola, who has been in St. Maarten for 16 years. 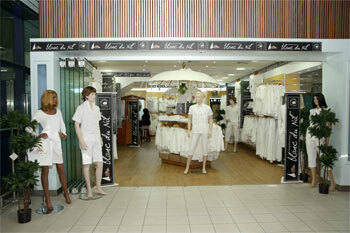 Blanc du Nil also has stores in Philipsburg and Maho. Blanc du Nil specializes in white cotton clothing for men, women and children. “All of them are timeless and easy to maintain,” according to Mr. De Sola. “Nicer things are coming,” he revealed as the store moves from the airside to the much larger unit downstairs.